kiefer sutherland | Wanna Catch a Movie? Thanks to a massive planet called Melancholia soaring through space and heading for Earth, the end of the world is near and there’s nowhere to hide. Melancholia debuted at the Cannes Film Festival just as The Tree of Life did. Both tackling issues about the universe and the course of human nature, it’s exciting to see how each film approached the subject. Melancholia is split into two halves, the first being ‘Justine’. Primarily focused on the wedding reception of newlyweds Justine (Kirsten Dunst) and Michael (Alexander Skarsgård), we are introduced to Justine’s dysfunctional family. Filmed in a documentary-like way by a hand held camera, we watch as this just-married couple appears to be tearing at the seams already. As Justine’s estranged parents openly argue in front of the guests, her disapproving mother (Charlotte Rampling) announces: ‘I wasn’t at the church – I don’t believe in marriage’. Far from the idyllic setting that a wedding reception would usually take, it appears this marriage was doomed from the get go. As Justine runs around the grounds becoming evermore depressed and desperate, there is no doubt she is an unstable girl with some deep setting issues (which normally makes for good film). The second half of the film is labelled ‘Claire’. Occurring maybe a few weeks after Justine’s car crash of a wedding reception, this half centres around Justine’s dull and monotonous sister Claire (Charlotte Gainsbourg) and her husband, John (Kiefer Sutherland). After the quick dissolution of her marriage, Justine moves in with Claire who insists she needs to be with family while Melancholia passes by Earth. However as time passes, the rogue planet appears to be closer to Earth than ever before, so we watch on as the end of the world becomes more of an imminent threat. Melancholia is quite a depressing concept for a film but one that has a lot of potential to explore humanity, right down to our faith and hope in times of, literally, impending death. While I loved The Tree of Life, Melancholia feels like less of an achievement to me. Yes, some scenes are beautifully shot, but it’s so boring to watch. I expected a bit of excitement and a sense of frantic desperation but with such a boring cast – excluding Dunst who at times had me gripped – it was hard to stay interested for 2 and a half hours. Though it has been praised for it’s artistic direction and sense of humanity, it didn’t feel new or evolutionary. The characters weren’t as fired up as I’d have been if this were to happen in real life, so how can we take this as a real depiction? No character’s reaction resembles that of a real person’s to news so huge like the end of the world, maybe perhaps Sutherland’s, but even that was underwhelming. While I get it’s meant to be a beautiful, artistic depiction of the end of the world and on some level, a sense of realisation and acceptance that nothing else can be done, Melancholia was boring and uninspired. Lars von Trier rallied up more interest and questionable thoughts from me when he made those comments about Hitler in his press conference for Melancholia. This entry was posted in Film Reviews - M and tagged 2011, 6.5/10, Alexander Skarsgård, Cameron Spurr, Charlotte Gainsbourg, Charlotte Rampling, end of the world, film review, kiefer sutherland, kirsten dunst, Lars von Trier, melancholia, planet, space on November 10, 2011 by Jen Horsman. The ones who started this vampire frenzy.. maybe not. But the ones who should be recognised and praised for making their mark in this ever growing genre from way back in the 80s.. certainly. Sam (Corey Haim) and his older brother Michael (Jason Patric) are typical American teenagers, but when they move house with their mother to Santa Carla, California, some very peculiar things begin to happen. They soon come to realise that Santa Carla, the murder capital of the USA, is in fact overrun with vampires. During the nights both Sam and Michael choose to hang out at the centre of town life, an amusement park on the pier. Michael is attracted to a mesmerising girl named Star (Jamie Gertz), and consequently meets her rough-and-ready boyfriend David (Kiefer Sutherland) and his gang of biker hooligans. Sam turns his attention to the comic book store and begins to hang out with the Frog twins, Edgar (Corey Feldman) and Allen (Jamieson Newlander), who work there and claim to be vampire hunters in their spare time. While their mother (Dianne Wiest), who finds employment at a video store, starts to date her boss. Although Sam doesn’t believe in the vampire stories that the Frog twins tell him about, he begins to notice that Michael is starting to become a creature of the night. He has a change of mind and starts to come around to the Frog twins’ way of thinking, the three of them collectively deciding that they need to destroy the vampire group and kill their head vampire, in order to save Michael from his transition to vampire. With plenty of gore, action and comical moments, The Lost Boys is a great vampire movie. Watching the film you can really place it in the 80s era. Having no CGI the film really relies on stunts and great make up, which it pulls off fantastically. The appearances of the vampires are great. Under the guise of group of biker boys and with their piercings, leather jackets, mullets and a very reckless attitude, no one dares to mess with them. In addition to this the soundtrack is great too. It all fits perfectly within the context of the film, and rather than getting too creepy like the plot suggests, it manages to laugh at itself and not be too serious. What we have with The Lost Boys is something that broke the mould and was well ahead of its time. Whereas now we are overrun with the vampire genre – Twilight, True Blood, The Vampire Diaries – this film doesn’t feel manufactured in order to rake in money by jumping on the bandwagon, because at the time there wasn’t one. Instead it actually established a new direction for the vampire genre to be taken. Schumacher, who directed the film, does a great job. 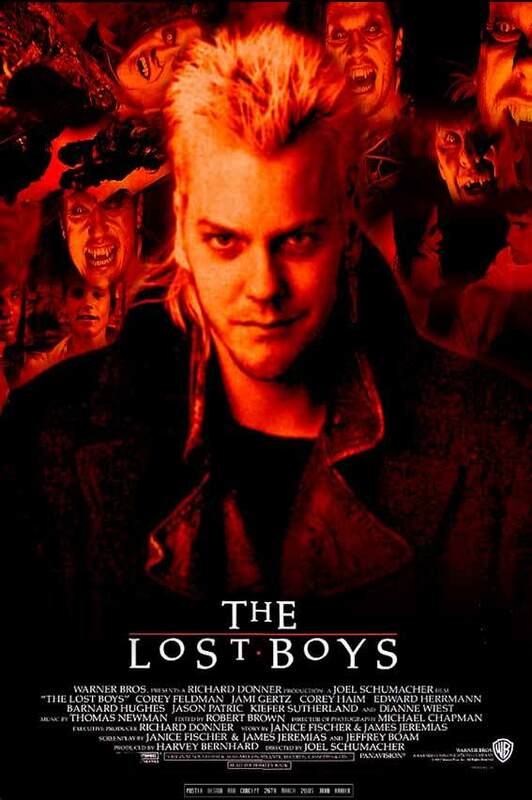 The Lost Boys is a fantastic vampire movie, and even though it was made over 20 years ago, it gives the modern day vampires a run for their money. This entry was posted in Film Reviews - L and tagged 1987, 7/10, cory feldman, film review, jason patric, kiefer sutherland, the lost boys, twilight, vampire on May 16, 2011 by Jen Horsman.